Heated/Cooled Leather Seats, NAV, Onboard Communications System, Back-Up Camera, WHEELS: 19 FR/20 RR AMG® CROSS-SPOKE..., Turbo, iPod/MP3 Input, Satellite Radio, Premium Sound System, Edmunds.com explains Jamming the gas is thrilling, not only because of the engine's power but also thanks to the deep roar it makes under hard acceleration. Each trim level boasts rewarding handling that will satisfy anyone, even those set on extreme racetrack performance.. Selenite Grey Metallic exterior and Black Exclusive Nappa Leather interior, AMG® GT C trim. Warranty 4 yrs/50k Miles - Drivetrain Warranty; SEE MORE! KEY FEATURES INCLUDE Leather Seats, Navigation, Heated Driver Seat, Cooled Driver Seat, Back-Up Camera, Turbocharged, Premium Sound System, Satellite Radio, iPod/MP3 Input, Onboard Communications System, Keyless Start, Dual Zone A/C, Heated Seats, Heated Leather Seats, Heated/Cooled Seats. Rear Spoiler, MP3 Player, Keyless Entry, Steering Wheel Controls, Rollover Protection System. OPTION PACKAGES WHEELS: 19 FR/20 RR AMG® CROSS-SPOKE TITANIUM. Mercedes-Benz AMG® GT C with Selenite Grey Metallic exterior and Black Exclusive Nappa Leather interior features a 8 Cylinder Engine with 550 HP at 5750 RPM*. MORE ABOUT US 2018 BEST OF KNOXVILLE AWARD WINNER FOR NEW, PREOWNED AND SERVICE, 2017 VAN DEALER OF THE YEAR-#1 IN USA, 2017 BEST OF KNOXVILLE AWARD WINNER, 2015 MERCEDES-BENZ BEST OF THE BEST AWARD WINNER Horsepower calculations based on trim engine configuration. Please confirm the accuracy of the included equipment by calling us prior to purchase.Heated/Cooled Leather Seats, NAV, Onboard Communications System, Back-Up Camera, WHEELS: 19 FR/20 RR AMG® CROSS-SPOKE..., Turbo, iPod/MP3 Input, Satellite Radio, Premium Sound System, Edmunds.com explains Jamming the gas is thrilling, not only because of the engine's power but also thanks to the deep roar it makes under hard acceleration. 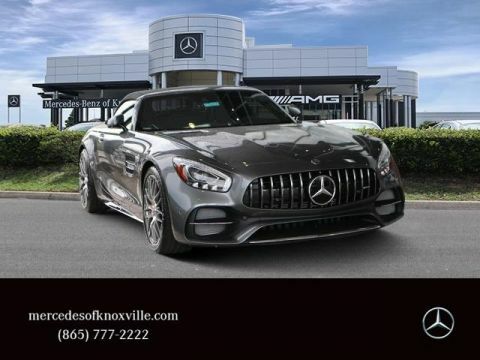 Each trim level boasts rewarding handling that will satisfy anyone, even those set on extreme racetrack performance.. Selenite Grey Metallic exterior and Black Exclusive Nappa Leather interior, AMG® GT C trim. Warranty 4 yrs/50k Miles - Drivetrain Warranty; SEE MORE! Leather Seats, Navigation, Heated Driver Seat, Cooled Driver Seat, Back-Up Camera, Turbocharged, Premium Sound System, Satellite Radio, iPod/MP3 Input, Onboard Communications System, Keyless Start, Dual Zone A/C, Heated Seats, Heated Leather Seats, Heated/Cooled Seats. Rear Spoiler, MP3 Player, Keyless Entry, Steering Wheel Controls, Rollover Protection System. WHEELS: 19 FR/20 RR AMG® CROSS-SPOKE TITANIUM. Mercedes-Benz AMG® GT C with Selenite Grey Metallic exterior and Black Exclusive Nappa Leather interior features a 8 Cylinder Engine with 550 HP at 5750 RPM*. Heated Leather Seats, Navigation, Moonroof, Turbo Charged, Power Liftgate, Full-Time All-Wheel Drive, HEATED REAR SEATS, PARKING ASSISTANCE PACKAGE, REAR SIDE AIR BAGS, AMG® PERFORMANCE SEATS, Captains Chairs, WHEELS: 21 BLACK AMG® FORGED CROSS-SP... DRIVER ASSISTANCE PACKAGE, EXTREME PERFORMANCE SPORT TIRES. AMG® GT 63 S trim, designo® Selenite Grey Magno exterior and AMG® Black Exclusive Nappa Leather/DINAMICA w/ Red Stitching interior. Warranty 4 yrs/50k Miles - Drivetrain Warranty; SEE MORE! KEY FEATURES INCLUDE Leather Seats, Navigation, Sunroof, Full-Time All-Wheel Drive, Quad Bucket Seats, Power Liftgate, Heated Driver Seat, Cooled Driver Seat, Turbocharged, Hybrid, Premium Sound System, Satellite Radio, iPod/MP3 Input, Remote Engine Start, Dual Zone A/C. Rear Spoiler, MP3 Player, Keyless Entry, Remote Trunk Release, Steering Wheel Controls. OPTION PACKAGES WHEELS: 21 BLACK AMG® FORGED CROSS-SPOKE Tires: 275/35ZR21 Fr & 315/30ZR21 Rr, AMG® PERFORMANCE SEATS, DRIVER ASSISTANCE PACKAGE Traffic Sign Assist, Driver Assistance Package (23P), Evasive Steering Assist, Active Speed Limit Assist, Active Distance Assist DISTRONIC, Active Lane Change Assist, Active Brake Assist w/Cross-Traffic Function, pedestrian detection, PRESAFE® PLUS Rear-End Collision Protection, Active Steering Assist, Active Emergency Stop Assist, Route-Based Speed Adaptation, Active Lane Keeping Assist, Active Blind Spot Assist, EXTREME PERFORMANCE SPORT TIRES, HEATED REAR SEATS, PARKING ASSISTANCE PACKAGE Surround View Camera, REAR SIDE AIR BAGS. Mercedes-Benz AMG® GT 63 S with designo® Selenite Grey Magno exterior and AMG® Black Exclusive Nappa Leather/DINAMICA w/ Red Stitching interior features a 8 Cylinder Engine with 630 HP at 5500 RPM*. 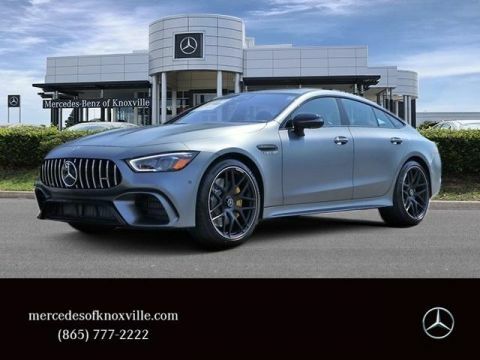 WHO WE ARE YOU BELONG HERE; DISCOVER AFFORDABLE LUXURY ONLY AT MERCEDES-BENZ OF KNOXVILLE! Horsepower calculations based on trim engine configuration. Please confirm the accuracy of the included equipment by calling us prior to purchase.Heated Leather Seats, Navigation, Moonroof, Turbo Charged, Power Liftgate, Full-Time All-Wheel Drive, HEATED REAR SEATS, PARKING ASSISTANCE PACKAGE, REAR SIDE AIR BAGS, AMG® PERFORMANCE SEATS, Captains Chairs, WHEELS: 21 BLACK AMG® FORGED CROSS-SP... DRIVER ASSISTANCE PACKAGE, EXTREME PERFORMANCE SPORT TIRES. AMG® GT 63 S trim, designo® Selenite Grey Magno exterior and AMG® Black Exclusive Nappa Leather/DINAMICA w/ Red Stitching interior. Warranty 4 yrs/50k Miles - Drivetrain Warranty; SEE MORE! Leather Seats, Navigation, Sunroof, Full-Time All-Wheel Drive, Quad Bucket Seats, Power Liftgate, Heated Driver Seat, Cooled Driver Seat, Turbocharged, Hybrid, Premium Sound System, Satellite Radio, iPod/MP3 Input, Remote Engine Start, Dual Zone A/C. Rear Spoiler, MP3 Player, Keyless Entry, Remote Trunk Release, Steering Wheel Controls. WHEELS: 21 BLACK AMG® FORGED CROSS-SPOKE Tires: 275/35ZR21 Fr & 315/30ZR21 Rr, AMG® PERFORMANCE SEATS, DRIVER ASSISTANCE PACKAGE Traffic Sign Assist, Driver Assistance Package (23P), Evasive Steering Assist, Active Speed Limit Assist, Active Distance Assist DISTRONIC, Active Lane Change Assist, Active Brake Assist w/Cross-Traffic Function, pedestrian detection, PRESAFE® PLUS Rear-End Collision Protection, Active Steering Assist, Active Emergency Stop Assist, Route-Based Speed Adaptation, Active Lane Keeping Assist, Active Blind Spot Assist, EXTREME PERFORMANCE SPORT TIRES, HEATED REAR SEATS, PARKING ASSISTANCE PACKAGE Surround View Camera, REAR SIDE AIR BAGS. Mercedes-Benz AMG® GT 63 S with designo® Selenite Grey Magno exterior and AMG® Black Exclusive Nappa Leather/DINAMICA w/ Red Stitching interior features a 8 Cylinder Engine with 630 HP at 5500 RPM*.